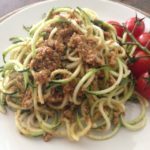 Raw Vegan Sundried Tomato and Walnut Bolognese Sauce – A fantastic raw vegan sun dried tomato and walnut bolognese sauce- tasting and looking remarkably like the ‘real’ thing. 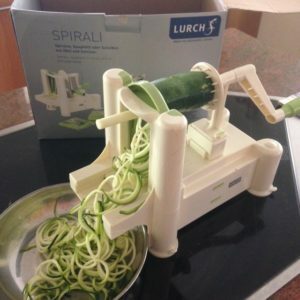 Serve with spiralised courgette spaghetti for a lighter and more nutritious meal than standard spaghetti bolognese, or as an entree. – sun dried tomatoes (soak overnight, drain and reserve soaking liquid), dates (about 1 large Medjool date- soak with walnuts), walnuts (soak overnight, separate to tomatoes), carrot (peeled and roughly chopped), celery (roughly chopped), garlic (roughly chopped or crushed), rosemary (leaves only, no stalk), red chilli (roughly chopped (optional)), basil leaves, extra virgin olive oil, salt and pepper (to taste), Soak walnuts with the dates, and separately soak the sundried tomatoes overnight. Drain and reserve the liquid from the tomatoes. ; Puree all ingredients together except the walnuts and the dates. ; Add the walnuts and the dates to the blender, and puree again. Thin with the reserved tomato liquid if necessary. ; Add salt and pepper to taste. Your bolognese sauce is ready! ; – Serve with spiralised courgettes for a delicious, light entree or main meal. A fantastic raw vegan sun dried tomato and walnut bolognese sauce- tasting and looking remarkably like the 'real' thing. 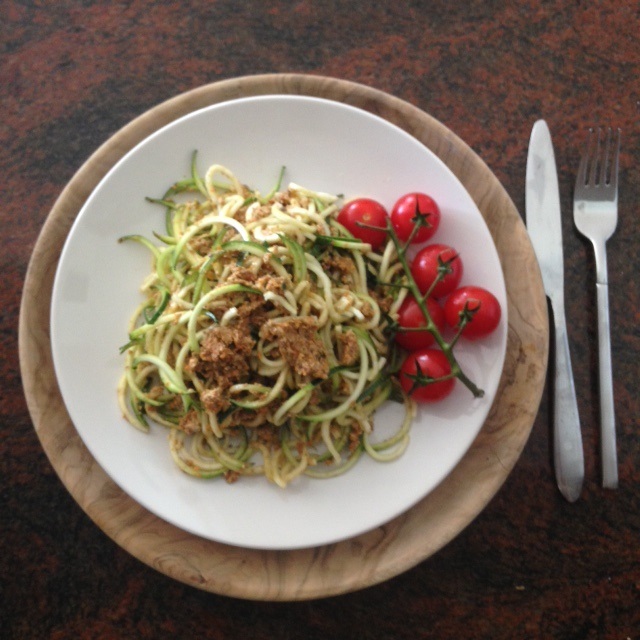 Serve with spiralised courgette spaghetti for a lighter and more nutritious meal than standard spaghetti bolognese, or as an entree. Soak walnuts with the dates, and separately soak the sundried tomatoes overnight. Drain and reserve the liquid from the tomatoes. Puree all ingredients together except the walnuts and the dates. Add the walnuts and the dates to the blender, and puree again. Thin with the reserved tomato liquid if necessary. Add salt and pepper to taste. Your bolognese sauce is ready! Serve with spiralised courgettes for a delicious, light entree or main meal.